Vivian is still looking for this lamb. I am looking for a 2000 Manhattan stuffed lamb. It is white with pink feet that are filled with beans. It is about the size of a football. My daughter’s is in disrepair, since Lambie always travels with us. We’d like to find a replacement. If you can help Vivian find this Large 2000 Manhattan White Lamb with Pink Feet, THIS SITE IS NO LONGER ACTIVELY MANAGED. Please use Our FREE FACEBOOK GROUP, including #052108-10 in the subject, . there is one listed on ebay right now if you are still looking! It is a buy it now or best offer with FREE shipping! I can’t believe that the lamb is gone!. I got the email yesterday and went onto ebay today and it was sold. I am so disappointed. 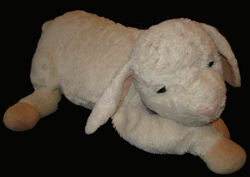 Yes, I am still looking if anyone out there has a Manhattan Toy stuffed lamb. I am so sorry! There must be many folks looking for that lamb. I will continue to keep an eye out for him! Buy it now or best offer with FREE SHIPPING!!! Maybe you can get this one before someone else does! I just made an offer on Lambie- the Gund stuffed toy. It is listed for $99.00 I don’t know about you all, but YIKES! Hopefully she will sell it for less. This one’s sort of expensive, but I think it’s your lamb!